The Petit Cadeau: Printable Gift Certificates for Men! Printable Gift Certificates for Men! Do you have a man in your life that sometimes (or all the time!) seems impossible to shop for? I will admit, I sometimes feel like I'm gifting the same thing over and over. Birthdays, Father's Day, Christmas, what to get each year? Sometimes I like to make my own gift, by gifting some kind of experience (like spending time with my Dad by taking him to coffee). The problem is, these "experiences" don't always come in gift card format. I searched and searched online for a "printable" blank gift certificate template - I will be honest, there wasn't much out there, and the ones I DID find, just didn't have the right look that I wanted. So! I decided to create my own! These printable gift certificates have a manly theme - with moustaches and nautical elements. The secret to these (in my opinion) is the kraft paper card stock. If you don't have any, I highly recommend it! It's SO versatile for your craft projects and gifting! Here's how to get yours! 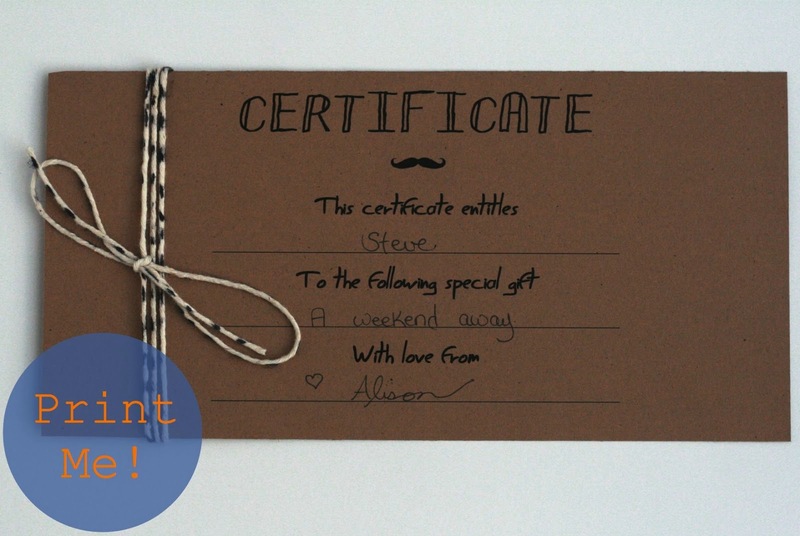 Grab the free printable manly gift certificate template HERE. Print on kraft paper card stock (you can find this in the scrapbooking section of your favourite craft store). Think of your gift and write your message. If you want to embellish your gift certificate, I followed the DIY Baker's Twine tutorial from A Step in the Journey to make my own baker's twine.